Ozzy and Jack are on the road again. A&E just announced season three of Ozzy and Jack’s World Detour will debut in June. The reality show follows Ozzy Osbourne and his son, Jack, as they travel across America. The new season will see Ozzy joined by his daughter, Kelly, as they travel to Missouri, Arizona, Nashville, and more. 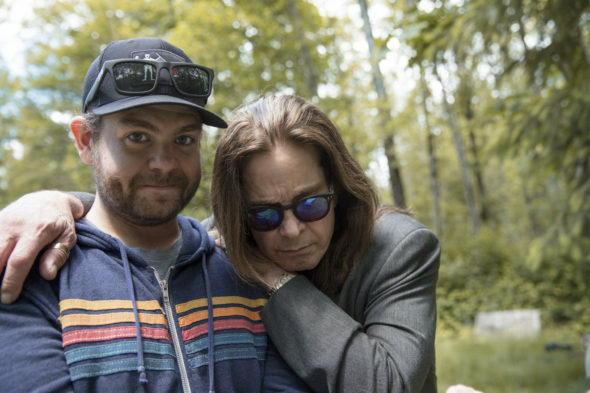 Season three of Ozzy and Jack’s World Detour premieres on A&E on June 13th at 9 p.m. ET/PT, followed by the return of Wahlburgers at 10 p.m. ET/PT. New York, NY—May 14, 2018—The Osbourne and Wahlberg families are back this summer on A&E Network with brand new seasons of their hit reality series. “Ozzy & Jack’s World Detour” returns for season 3 with another epic family road trip, with the addition of Kelly Osbourne behind the wheel, on Wednesday, June 13 at 9PM ET/PT followed by new supersized hour-long episodes of “Wahlburgers” that take a closer look at the family’s expanding popular burger business at 10PM ET/PT. In this season of “Ozzy & Jack’s World Detour,” rock-legend Ozzy Osbourne is anxious to hit the road to escape the stress of planning his final solo world tour. To get away from the pre-tour insanity, he hatches a plan to get back in the RV and take a cross-country road trip to Florida for his first gig. While his son, Jack, loves the idea of hitting the road again, there is one problem: Jack and his wife are awaiting the arrival of their third child and can’t leave Los Angeles. Until Jack can rejoin the trip, he enlists his sister, Kelly, to help get their dad on the road to Florida. Along the way, Jack plans stops at explosion school in Missouri and space camp in Alabama, while Kelly takes Ozzy to check out western wear in Nashville and goat yoga in Arizona. To show Ozzy how important his music is to people all across the country, Jack surprises his dad with unique musical tributes including mariachi bands, marching bands, and even a kids’ xylophone orchestra playing “Crazy Train.” With three Osbourne’s together on the road for the first time in decades, anything can happen. This season of “Wahlburgers” adapts a new hour-long format as the series takes an even deeper dive into the high stakes business world of Mark, Donnie and Paul Wahlberg’s restaurant chain. With plans to double in size in just one year, the brothers take on a huge risk by setting their sights on entering into an entirely new fast casual market by creating an “Express Model” version of Wahlburgers. With heart, determination and some humor, this season follows the brothers as they work to partner with monster retail brands and propel themselves into hundreds of locations and untapped markets. Mark and Donnie’s dream of creating a legacy to outlive them is in their reach, but Paul is resistant as he wants to make sure they maintain the quality and experience he’s always promised to deliver. With the help of Alma who always reminds the brothers to stay true to their humble beginnings, the brothers try to work it all out. What do you think? Have you seen Ozzy and Jack’s World Detour? Will you watch the new season? More about: A&E TV shows: canceled or renewed?, Ozzy and Jack's World Detour, Ozzy and Jack's World Detour: canceled or renewed?, Wahlburgers, Wahlburgers: canceled or renewed? Excellent. This is one of those gems of a show that might not appeal to some but once watched, hooks you.